To begin with, there aren’t many government-owned airlines in the world. There is none in the United States and such entities are becoming rarer in Europe. Sooner or later, that trend will spread to Asia, inevitably in Malaysia. Maybe only in the rich Gulf countries such airlines can exist. Malaysia is not as rich as Gulf countries where money is almost unlimited. Therefore the people, especially the taxpayers have plenty of reasons to be mad at the loss-making GLC’s. There is no genuine excuse for their losses. MAS is one of the blue-blooded Malaysia GLC’s that put prestige far above profit. However, such practice is unbecoming considering the losses can be billions of Ringgit. Maybe they think- why should they care since it’s not their money. For the last 7 years, the national carrier has made three cash call exercise for the amount of RM7.3 billion only to accumulate losses RM4.1 billion in three years’ time. This has happened in spite of in 2013, the pilots are flying more and the planes are flying 12 hours daily from eight hours previously. MAS achieved its best ever load numbers (81%), even beating rival SIA (79%). MAS flew additional 4 million passengers last year, making the total passengers of 16 million. So basically, they have added 20% more capacity and passengers whilst using the same number of aircraft and people, and therefore the staff productivity is up by 20%. Therefore, It is mind-boggling to see MAS has incurred losses amounting RM 5 million per day. To make things worse, more than 1000 flight cancellations have been made since the tragedy of MH370. No Wonder lately there are several options being proposed to restructure the airlines. On top of that- should the company file for bankruptcy, then operate under a new company and with the same name just what Japan Airlines (JAL) and American Airlines did? Admittedly, bankruptcy is one of the fastest ways to turn it around. But it is not as easy as it sounds. When the JAL filed for bankruptcy, It has shed all its jumbos, cancelled unprofitable routes, reduced staff by a third, persuaded its unionised pilots and staff to take big pay cuts, and slashed its pension payouts by up to half. Given the politically sensitive government at the helm, obviously this is not an option as far as political backlash is concerned. In fact, MAS has the glaring disadvantage of having several unions which can hold the company to ransom. Do you expect these unions to be happy if they are being told that the destruction of their jobs will be good for the company in the long term? How do you tell a man being devoured by a tiger that he is really helping to preserve a treasured species? Historically, the unions can even force the government to rescind the share-swap agreement. Therefore, it is the only right thing for MAS to have a gradual and sustainable recovery model through harnessing the assets and keeping the people that they have. Well, how do you that? When a business is faced with stiff competition, it can either increase prices or reduce the cost. However price can only be increased to a certain extent. MAS can’t price itself more than Emirates and SIA because if they do, then no one will fly with them. In fact, MAS has to dump its fare to ensure they will not be out of the race. Already their market share in KLIA was slashed by half from 54% to 28% and they are not the No 1 carrier in their home country. Given such scenario, it would be better to reduce costs and minimise the increase in price. All its cost can be examined to determine which are truly necessary, which cost can be reduced, which service can be curtailed or modified etc,etc. For any restructuring plans to work, serious problem must be addressed first. MAS must cut off the cancerous arms and treat the bleeding organs before undertaking any prescriptions. There must be something wrong with MAS’ cost structure given for every available seat per kilometres, they lose 5.6 cents. MAS’s organization is said to be convoluted by having 11 divisions, 210 business divisions and more than 100 senior executives. Clearly, wastage happened at the senior management level. Next, wastage at the supplier level. The issue of lopsided procurement contracts obviously referring to the catering contract and the practice of preferred contractor must be dealt with. We were told by terminating a catering contract, MAS can save about RM300 million per year. Some might say MAS is overstaffed. MAS with about 100 aircraft has almost 20,000 employees while AirAsia with 300 planes has only 9,000 staff. The reason is, the number of pilots and cabin crew can’t be the same between these two companies since the working rules are different. Due to this, some of these airlines can afford to outsource their front end services and engineering works. On the other hand, MAS do most of them and that is why the headcount gets big. But essentially, it is about getting maximum output from the 20,000 people. We must realize that being big is not the cause of MAS’ problem. The size of the workforce, connectivity, and network may actually be one of MAS most important strengths. The best way to restructure MAS is not through financial engineering such as asset stripping or de-list and re-list exercise. MAS has enough cash or capital. Khazanah, being the owner, may not necessarily have to invest more money. It would be better if they restructure the allocation of resources by tweaking MAS’ business model. The most radical yet sensible approach is to split up MAS to become two entities. Currently Firefly is not a serious competitor to AirAsia or Malindo. Unless Firefly is being transformed from a mere community operator into a formidable low-cost carrier with large fleets and huge connectivity, then MAS can consider splitting the current airline into a hybrid domestic/regional airline like Malindo Air and a premium international airline. The market has changed for the past 10-15 years where 80% of air travellers want to fly budget. The growing middle-income class in Malaysia and Asean region is very price sensitive. Therefore, it is not surprising to see that Malaysia’s air transport premier market is very small. For that reason, MAS has to cater the 80% market rather than squeezing its yield in the 20% market. There is no way that MAS can compete against Air Asia, at least domestically and regionally. While it may be true Air Asia enable more people to fly, but it does at the expense of MAS passengers. The ‘split-up’ move is also necessary because you can’t have two cost structures under one business entity and it is foolish to have a different brand proposition under one name/brand. The icing on the cake from this move is that, by splitting up MAS, it will eventually split up the ‘powerful’ unions. MAS could enjoy the same advantage like profitable airlines such as Air Asia, Emirates and SIA that have no unions. MAS will be able to run the business uninterrupted by the demanding unions. For the record, MAS currently has 7 unions. Imagine a hybrid low-cost domestic airline that flies within three-hour radius destination together with MAS hospitality and experiences to compete with Air Asia. And this hybrid airline can become a feeder airline to the premium international airline. Since both airlines are flying from KLIA and KLIA2, the possibility is endless. 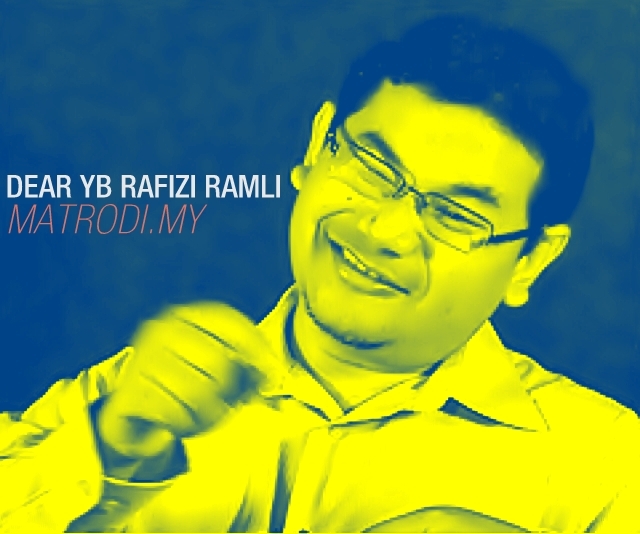 Ke hadapan Ahli Parlimen Pandan YB Rafizi Ramli. Politik Malaysia bertuah kerana mempunyai seorang ahli politik yang dikatakan bijak pandai, petah berbicara dan otak bergeliga. Tetapi bijak pandai sahaja tidak menjamin seseorang ahi politik itu untuk tidak menjadi bijak auta dan berkata dusta. YB adalah perancang Kajang Move. Kononnya ia penting untuk misi ke Putrajaya di samping menghalang kejatuhan Selangor daripada gerakan ultra Tun Dr Mahathir. Tetapi hairannya, selepas 8 bulan, yang saya nampak hanyalah Tun Dr Mahathir dilantik menjadi Pengerusi Proton, bukannya Pengerusi Perhubungan Negeri BN Selangor.Tidak mungkin kerana pejabat Proton di Selangor maka YB berasa Tun Dr Mahathir cuba merampas Selangor. Apapun pada forum malam semalam, YB berkata Kajang Move adalah untuk menggantikan TS Khalid kerana beliau disyaki mempunyai masalah integriti. Yang menggelikan hati saya adalah apabila YB berkata ‘what we heard was enough for us to initiate the Kajang Move without enough document on Tan Sr Khalid.’. Adakah ini bermakna saya boleh mendesak YB daripada menjadi ahli parlimen Pandan walaupun saya tidak ada bukti kukuh tentang ‘cakap-cakap’ liar mengenai skandal YB dengan syarikat konsesi air SPLASH? YB juga berkata sanggup kalah pilihanraya di Selangor demi prinsip. Bolehkah saya ingin mencadangkan agar YB- atas nama prinsip- lancarkan Segambut Move untuk desak DS Anwar Ibrahim yang buktinya lebih daripada 50 muka surat mengenai salah laku, krisis moral dan integritinya untuk berundur daripada menjadi ahli politik? Boleh? Atau tidak boleh kerana semua itu konspirasi? Antara isu yang dibangkitkan YB adalah urusan jual beli tanah di antara kerajaan Negeri dengan pemaju Eco World. Ini sangat aneh memandangkan TS Khalid telah membekukan kelulusan pembangunan di 1,172 ekar tanah di Canal City selepas Tropicana menjual 308 ekar daripada tanah yang dibeli daripada Selangor kepada Eco World untuk ‘easy money’. Oleh itu, mengapa YB menyalahkan TS Khalid yang cuba mengajar pemaju hartanah tersebut? Bukankah apa yang beliau lakukan itu selari dengan prinsip integriti yang YB canangkan? Atau sebenarnya ada sesetengah ahli politik di belakang pemaju iini? YB, saya faham yang jarak Selangor lebih dekat dengan Kemaman berbanding Pulau Pinang. Oleh itu mungkin YB telah terlepas pandang mengenai urusan jual beli tanah di bawah harga pasaran yang telah berlaku di Penang Waterfront dan Penang Turf Club oleh IJM Land dan Berjaya Land. Pada masa yang sama pembinaan terowong bawah laut di Penang yang bernilai RM4.3 Biliion telah dijalankan tanpa tender terbuka dan akan menyebabkan rakyat Penang membayar tol. Bukankah ini bertentangan dengan apa yang YB perjuangkan mengenai pembinaan Kidex? Mengapa prinsip YB tidak diserlahkan di negeri Penang dengan mendesak Lim Guan Eng berundur sebagai Ketua Menteri? Bukan sahaja YB sudah kantoi menipu, tetapi YB juga bersikap hipokrit dan double standard. Sesungguhnya saya amat sedih kerana saya melihat YB adalah harapan rakyat Malaysia dan saya begitu kagum dengan prinsip YB. Silap hari bulan, YB boleh kena tangan. As a Selangorian, what happens in Selangor is really disturbing. Even it is quite scary. The issue of Menteri Besar of Selangor can’t be taken lightly. In fact, it must be seen in the wider context and not just hovering around the question of whether Tan Sri Khalid will stay or not. Selangorians must prepare for the worst. This is because the state will be leaderless and directionless for longer they can imagine. Most likely it will remain so until PRU14. Let us analyse the situation further. Firstly Pakatan Rakyat in Selangor is collapsing for the simple reason; they have no better candidate than Tan Sri Khalid to be the Menteri Besar. No doubt, this is the only reason why all the component parties can’t agree n Kajang Move. Secondly, if TS Khalid remained as Menteri Besar, he will not be able to govern the state according to his wishes. Just imagine, some of his Exco Members, local councillors and supporters are against him and will likely to do anything to ensure the downfall of him. Any policies proposed by TS Khalid will depend on the support from a component party (PAS) and the opposition party (UMNO) since his own party (PKR) and DAP are not behind him. Therefore, the policy cannot be implemented and things will remain the same, even it needed to be changed. What’s more, there is a real possibility of sabotage within his government. Any attempt to ‘neutralize’ the anti-MB faction will be seen as undemocratic and will be exposed to the public. Infighting, indecisiveness, and instability will erode investor’s confidence. In the end, TS Khalid will become a lame duck Menteri Besar, just like any civil servants who wait for their retirement age to come. They are unlikely to be aggressive, visionary and just ‘play it safe’. But does it mean that things will get better if the MB Selangor changed? Not necessarily. As a matter of fact, it may be worse. If Pakatan Rakyat manages to replace TS Khalid, the new MB did not have the full support of all component parties. Not only the new MB needs to compromise in order to appease each party, practically speaking, the new MB will forever be exposed to power grabs just like what has happened to Tan Sri Khalid. It may be Azmin Ali- the MB Selangorians never have. It could be PAS or DAP- the party with the most seats. Or it may go back to TS Khali d again. Anything is possible. The point is, ‘what you give, you get back’. The new MB will spend most of the time to pacify people who sulk and to fend off any political attacks and manouvres from political nemesis. If this is the case, when the new-MB will actually govern? This situation is like some GLC CEOs who work only to appease their political master so that their contract will be renewed. In the context of Selangor, the chairman is no other than the husband of the new MB. Nepotism much? Apart from the mentioned possibility, the most pressing question is, can Dr Wan Azizah provide a radical approach in dealing with water restructuring exercise, the new highways issue and the greedy corporate tycoon in Selangor? With due respect to her, she had no experience in administration nor does she enjoys the reputation as a party president who ‘call the shots’. So is this the deal to Selangorians by offering the worse MB to lead the state? Or is the new MB a mere puppet? Pakatan Rakyat’s poor governance, nepotism and blatant disregard for the needs of the people have crossed the line. But Selangorians will still support them. They have no alternative. Despite all the problems, UMNO also can’t put forward anyone credible than the current warlords who would be acceptable to the Selangorians. Even after the disastrous General Election, BN Selangor appoints the same politician who is responsible for the dismal performance of the coalition. The party machinery has failed to capitalise the MB saga to win back the trust of Selangorians. Now we heard that BN Selangor wanted Khalid Ibrahim to continue BN Selangor. Maybe they are not interested to be in power. Or maybe for them the water fiasco, the public housing issue and the pothole problem in Selangor are acceptable. Maybe after some times being the opposition, they found that it is very much easier than to be the administrator. BN Selangor seems to suffer from amnesia. They forgot under their administration the state recorded average growth of 7.2% for nearly 40 years compared to average 4.5% during Pakatan’s rule. 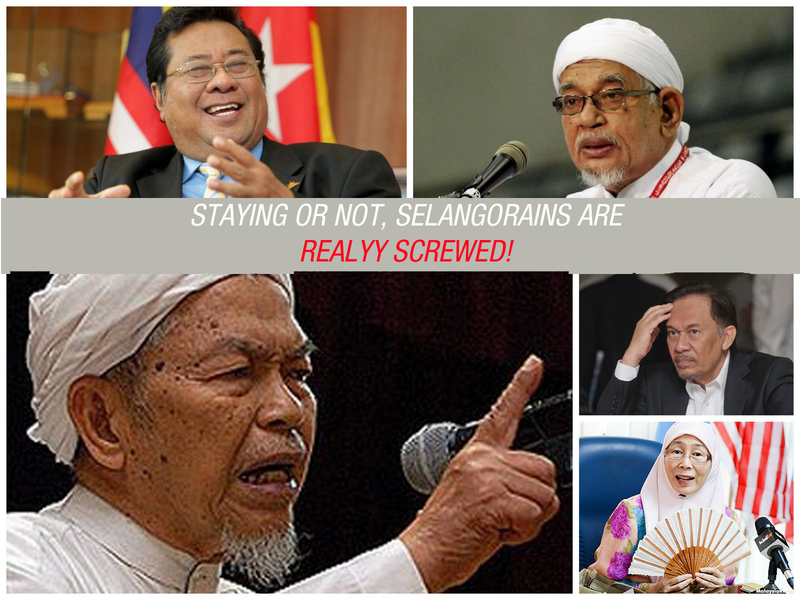 Therefore it is right to say whether TS Khalid will stay as MB or not, Selangorians are really screwed. The current MB, who according to the brilliant Rafizi Ramli, has set gold standard for administration will be replaced. His successor’s credential is questionable and they have no alternative to vote for. It is that bad, to the extent that the politics in Selangor have to be dictated by non-Selangorians such as those from Permatang Pauh and Kemaman. Seriously, where have all the Selangor politicians gone? Selangorians, you (we) are really screwed. Ps: The Selangor state government is in the process of finalising the restructuring of water industry that will ensure water supply for the state.